The County closed day three on 522 for four in reply to Glamorgan’s first innings score of 570 for eight declared, but they failed to take the maximum batting points as their progress was too slow. It does means that 1,092 runs have been scored for the loss of just 12 wickets in Cardiff, with five players scoring centuries, and although Newton was one of those five, he wasn’t impressed. And he suggested there will be no sorts of deals done between the skippers to try and set up a chance of a positive result on the final day. “The pitch was shocking,” said Newton, who put on 303 for the first wicket with Ricardo Vasconcelos, who hit a career best 184. “There was no carry, pace or movement and we had to graft for our runs on this slow, low pitch. 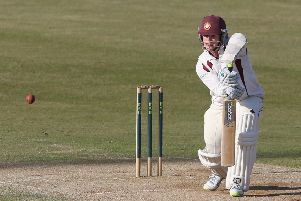 Rob Keogh is 73 not out overnight, and Adam Rossington is unbeaten on 32, and it seems likely that Northants will again take to the crease on Sunday’s final day. As well as the centuries for the openers, Josh Cobb hit 60 while the only failure was skipper Alex Wakely, who was dismissed for 18. Glamorgan’s Billy Root didn’t agree with Newton’s verdict on the wicket, and suggested the Northants batters made harder work of the situation than necessary. “Our bowlers stuck to their task well, and it did give opportunities to the spinners who got plenty of practice as the seamers were able to rest,” said Root.